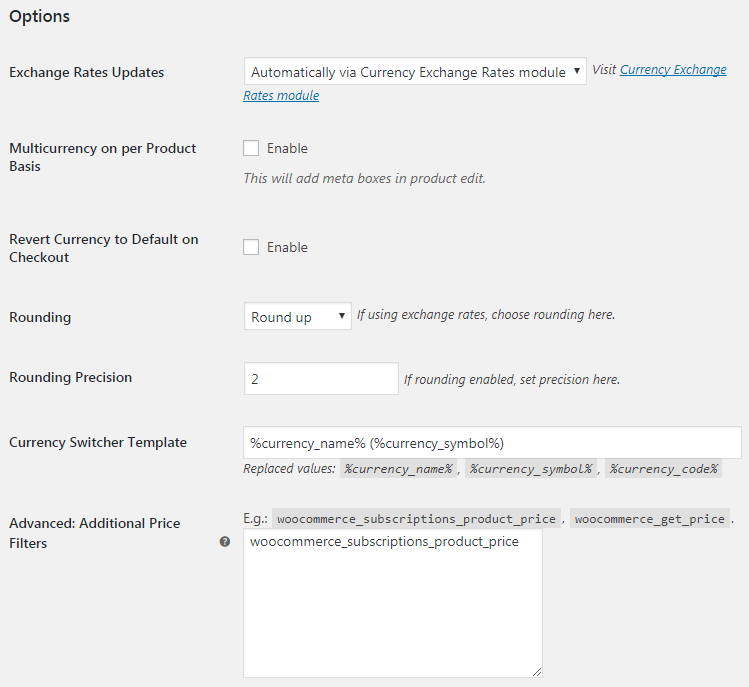 When enabled, WooCommerce Multicurrency (Currency Switcher) module adds multicurrency (currency switcher) to your WooCommerce shop. First you will need to set which currencies you want to add. 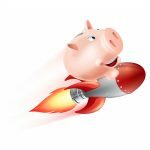 Go to admin options in WooCommerce > Settings > Booster > Prices & Currencies > Multicurrency. Then go to Currency Options, set number of Total Currencies and press Save changes button. Please note that you will probably need to add current (original) shop currency here (with an exchange rate of 1), so most likely minimum number here should be set to at least 2. 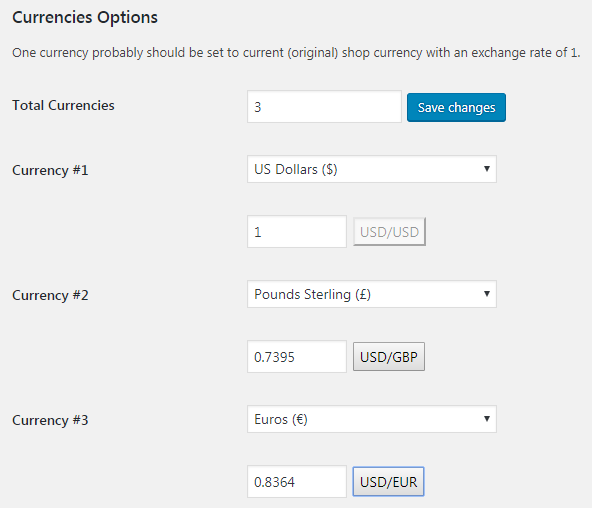 Then choose currencies you want to add from drop down lists and set exchange rates for each currency. Rates can be set to update automatically or manually. If you prefer setting price in each currency on per product basis (instead of using automatic price calculation by exchange rates) – enable Multicurrency on per Product Basis checkbox and go to product edit page. Select how you want currency exchange rates to be updated. Possible options are: manually or automatically via Currency Exchange Rates module. If you enable this option, you will be able to enter prices for products in different currencies directly (i.e. without exchange rates). This will add meta boxes in product edit. Enable this if you want prices to revert back to your shop’s default currency, when customer reaches the checkout page. If using exchange rates, choose rounding here. If rounding is enabled, set rounding precision here. Set how you want currency switcher to be displayed on frontend. Replaced values: %currency_name%, %currency_symbol%, %currency_code%. Add additional price filters here. One per line. Leave blank if not sure. E.g. : woocommerce_subscriptions_product_price, woocommerce_get_price. Set total number of currencies here. One currency probably should be set to current (original) shop currency with an exchange rate of 1. Press Save changes after setting this option, so new settings fields will be added. Here you can select which currency you want to add. Also, in case if you selected "Enter Rates Manually", you can set exchange rate here. In case of automatic updates, rate will be updated automatically. You can also grab current exchange rate by pressing button near the exchange rate field. This section lets you set default currency for user role. Leave blank to disable. 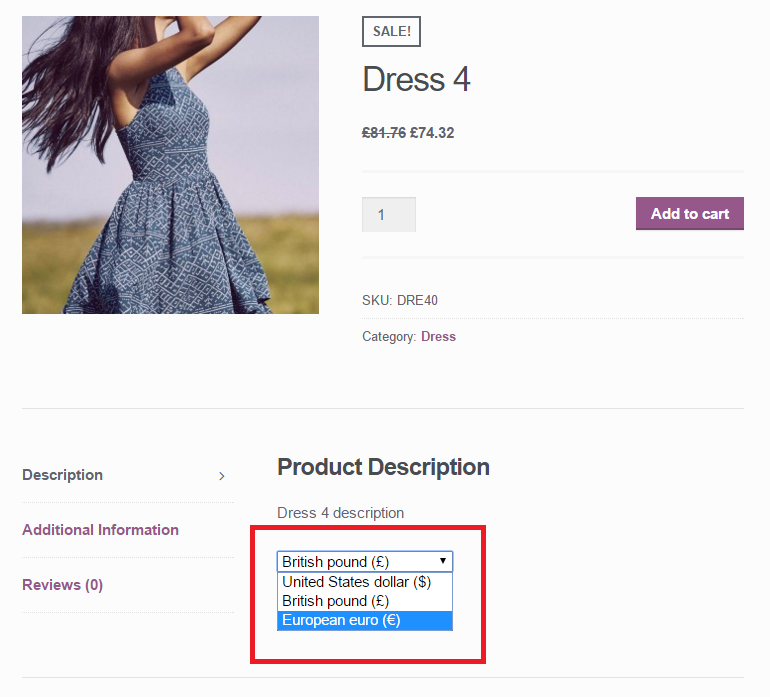 If you want to place currency selector near the price, you could use Product Info Module – WooCommerce > Settings > Booster > Products > Product Info – and add [wcj_currency_select_drop_down_list] shortcode there. You can add currency switcher as a custom link with URL /?wcj-currency=EUR etc. You may want to put switcher shortcode in text widget – you can enable shortcodes in WordPress text widgets in Booster’s General module (in “WooCommerce > Settings > Booster > Emails & Misc. > General”) with “Enable All Shortcodes in WordPress Text Widgets” checkbox. By default “Multicurrency (Currency Switcher)” module is run after the “Price by User Role” module, so if you are using per product prices in “Multicurrency (Currency Switcher)” module (i.e. aren’t using exchange rates), “Multicurrency (Currency Switcher)” module prices will just overwrite the “Price by User Role” prices. To fix this, you need to change modules priorities so that “Multicurrency (Currency Switcher)” is run before the “Price by User Role” module. There are “Advanced: Price Filters Priority” options in both modules – try setting “Multicurrency (Currency Switcher) > Advanced: Price Filters Priority” to 999, and “Price by User Role > Advanced: Price Filters Priority” to 1000. Useful and frankly works best out of all I’ve tested but there is no api documentation. Would be great to have fast access to info needed for integration with other plugins. Like how to get current currency and it’s rate. Will be done, however our *user* documentation is far from full now, so I’m not sure when we will get to the API. Meanwhile I could try to guide you, so please contact me on support@booster.io if you have any questions. $currency_code is the second code from currency pair, that is if your shop’s main currency is USD, you should set $currency_code to EUR, to get USD/EUR rate. I’m doing something wrong? Inside the settings of the coupon there is nothing to specify the currency of the amount to discount. Sorry for the delay. Unfortunately at the moment coupon’s currency is not converted. I will try to add it to some of the next updates. Since I am a store owner, not a programmer, I don’t know what to do with this information. Where would I place either of these? I can open and edit files, but I don’t know which file(s) to edit, and where in the file to place the code. Also, if I were to use the widget instead, where would I place it? Regarding widget – you can use it the same as you would any other WordPress widget, i.e. go to your site’s admin dashboard, then Appearance > Widgets. There you can drag and drop “Booster: Multicurrency Switcher Widget” to any widget area. Regarding shortcode – for example you could place it inside single product’s summary area. To do that you need to enable “Product Info” module (in “WooCommerce > Settings > Booster > Products > Product Info”). Then add [wcj_currency_select_drop_down_list] shortcode to “Content” field. for some reason my currency switcher isn’t working well, as in that it does refresh the page, but still with the old currency. So when the currency was Euros, and I change it into US dollar, price and currency symbol will stay on Euros. Going to another product will then display in the prices and currency symbol for dollar. Would it also be possible to create links to put in a menu, like a menu on the top of the page? Would be perfect to have currency and language together in a top menu. Same problem. Default currency is EUR. I added MYR for Malaysia. Now even when switch to EUR it displays correct prices but symbol is MYR (wrong). Can anyone please help? I want to buy the booster plus version. But before that, I see some issues in free version. It only changes the symbol. Same issue is seen in woocommerce layered nav active filter. Also, please note that it doesnt work for mini cart option. Only when user moves to the cart page, mini cart is updated. Or else, it shows the old values. Need all these 3 issues resolved. There is another issue as well. So, when a user goes to the site, until now, both products are showing correct converted value. I see that the booster fails to realise its in SGD and converts the already converted value once more. This is wrong and serious bug. Hello, I am currently using WooCommerce Multicurrency (Currency Switcher) on my site and am looking to add some more functionality. I want to upgrade to the plus edition but want to ask about a feature that I don’t think you cater for but is something that I would need for my site. I am building a worldwide resource catalog for a brand product. There are different products available to different counties in different currencies at different prices. I am linking to the products where they can be purchased using the External/Affiliate Product. 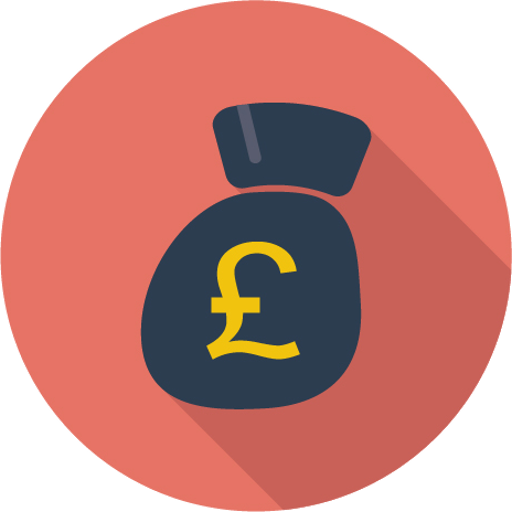 At the moment I am trialing your plugin using just UK and US currencies and it works well. What I would like it to do in addition is to call up a different ‘Buy it from…’ button for each of the different countries and currencies. I have tried inserting it in the custom css option of the child theme but it doesn’t work. I also tried inserting it in the fuctions.php of the child theme but no luck. Can you please guide me as to where I could insert the code or maybe insert a different code in the custom css please? This tool doesnt work for mini cart option. Is there a way to change the currency name? For example, I don’t want Pounds Sterling £ in the list, I’d like to have just Pounds or Sterling £. I used the multi-currency switcher and whenever a coupon is applied to the cart all the values are multiplied by 100. Both work fine by themselves…. any way to fix this? I tried to use this module currency switcher but when selecting another currency, the page refresh but nothing is happening unfortunately. Hi Awag, I too am experiencing this but it’s a problem that only started recently. This used to work. I believe it may be a conflict with another plugin, but can’t prove this. If you find a solution, please reply and let us know! I recently purchased your collection of plugins for the currency conversion options. I set up the currencies i needed in the free version, everything worked how I had hoped. For convienience I purchased your product so I could take benefit from the automatic currency conversion module. Everything worked great until I logged out. When I use the site and i’m not logged in i get an error when trying to cover currencies. I’ve cleared the cache, disabled all other plugins, updated to the latest versions of everything. Still get the same result. When I’m logged in as an administrator I can use the Currency Switcher Widget, it works perfectly. When I log out, to test as a customer I get the above error. I hope the is a solution for this. how can i retrieve the $final_value ? I Use Booster plus, The Multicurrency (Currency Switcher) is fine on PC but on mobile phone, the other widgets are appear, but the currency switcher isn’t. Can you contact us at support@booster.io with the url to your website? Thank you. Do you have any plans to allow styling of the drop down? I have used a similar currency switcher from another vendor that gives a much nicer drop down with the flag included in the display, etc. I much prefer the functionality of yours but the styling is a sticking point. The currency selector doesnt stand out for my users and I get questions about currency all the time because they don’t see the selector. Typically styling is based on your current theme but if you want the switcher to have flags then that’s possible as well. For that you would want to use a “Prices and Currencies by Country” module and use its [wcj_country_select_drop_down_list] shortcode or “Booster: Country Switcher” widget instead. You would also have to enable “Add Countries Flags Images to Select Drop-Down Box” option in the module settings. Having an issue with the plugin. Currency is converting properly, showing properly, checking out properly, charging properly. But when I look in my orders section of the website while the price is the converted value, it shows it as being in the wrong currency. For example, I have an item that is $45CAD + shipping. It converts to $27.86 USD. The user can select that currency, see that all the way through the order process, and complete the order. In my payment processor it charged $27.86 USD. But when you look in my orders page it shows as $27.86CAD and any invoices I print or information tagged with the order shows that same incorrect currency. Is there any way to properly show the currency charged in there? This is a big problem for my mail ins and my accounting. Can you contact us via email at support@booster.io? Thank you. I’m using the widget for this module and am having a few issues. 1: Unlike the Country Switcher, it doesn’t show country flags when I enable the option in ‘Prices and Currencies by Country’ module. Regarding your points 1-3 we have added those to our todo list. Can you please contact us about your issue at support@booster.io? Please help! I have not clue what to do and I really like your plugin! why does this double calculate? Could you please try enabling Booster’s “General” module (in “WooCommerce > Settings > Booster > Emails & Misc. > General”) and enabling “Recalculate Cart Totals on Every Page Load” checkbox there. but if at this point this $class_instance->get_current_currency_code() returns ‘USD’ at any way. Hello! I’m using your plugin in my website and i have a issue with the multicurrency. When you change the currency and add product to the cart the currency switcher do it for two times. That is to say the exhange rate is multiplied by the final price twice. I don´t know why this happens, any help with this issue?. Could you please try enabling Recalculate Cart Totals on Every Page Load option in “General” module (in “WooCommerce > Settings > Booster > Emails & Misc. > General”)?